Based in Boston metropolitan area and covering all Massachusetts Courts. Hourly, contingent and "hybrid" fee arrangements for cases from $10,000 to more than $1 million. As to small claims matters, I may be able to assist you with an appropriate referral. MY GOAL IS TO HELP MY CLIENTS ACHIEVE THEIR GOALS. 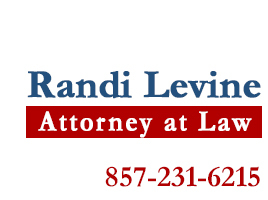 e-mail randi@randilevine.com or call 857-231-6215.